"To say 'Donald Trump cheats' is like saying 'Michael Phelps swims'." That's the claim of former Sports Illustrated columnist Rick Reilly, who has written a book entitled 'Commander in Cheat: How Golf Explains Trump'. 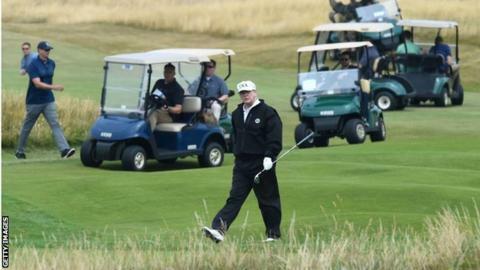 The US President is frequently seen on golf courses, flanked by buggies full of secret service personnel, and he owns 14 clubs of his own - including Trump Turnberry in Scotland. But should you ever find yourself sharing a round with the president - yes, chances are slim - watch your back, Reilly says. "He cheats at the highest level. He cheats when people are watching and he cheats when they aren't," he says in the book, which is released this week. "He cheats whether you like it or not. He cheats because that's how he plays golf...if you're playing golf with him, he's going to cheat." Golf is a sport where players routinely call penalties on themselves, or ask for rulings from officials, or playing partners in the amateur ranks. Reilly has spoken to several players, both professional and amateur, who have shared a course with Trump. Rocker Alice Cooper and former boxer Oscar De La Hoya have also previously spoken out. Others have also questioned the president's sportsmanship - or alleged lack of it - in the past. "We clearly saw him hook a ball into a lake at Trump National [in Bedminster, New Jersey] and his caddy told him he found it," said Hollywood actor Samuel L. Jackson in a 2016 interview. LPGA professional Suzann Pettersen has highlighted Trump's caddy and underhand tactics too. "No matter how far into the woods he hits the ball, it's in the middle of the fairway when we get there," she told a Norwegian newspaper last year. According to Reilly, Trump also dismisses long-standing golf traditions - never removing his cap for a handshake or taking it off in the clubhouse. He even drives his buggy onto the green. By all accounts, Trump is a fine golfer. He claims to have a handicap of 2.8. That's a lower handicap than 18-time major winner Jack Nicklaus, seven years his senior, who plays off a handicap of 3.4. "If Trump is a 2.8, Queen Elizabeth is a pole vaulter," says Reilly. Trump has always denied cheating when his sporting ethics have been questioned, including when Reilly spoke out as part of a Washington Post investigation into his alleged gamesmanship in 2015. "I always thought he was a terrible writer," Trump said. "I would say that he's a very dishonest writer."